It won’t be news to any of our US-based readers, but 1983’s beloved and massively successful science fiction miniseries V is currently being given an update. V is about a race of aliens (the “Visitors”) arriving to Earth with possibly nefarious intentions, and how humanity interacts with them. The Visitors have gigantic spaceships, the interiors of which contain mind-blowingly futuristic architecture. Mind-blowingly futuristic architecture? 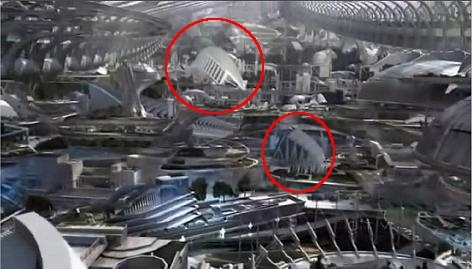 Where to turn, other than Valencia’s Ciudad de Artes y Ciencias?! Calatrava’s tiled white creations have always looked like something designed by an alien race, so it might not be too surprising to see them pop up in the new series. Pretty sweet! Though I’m in the States, I missed the series premiere. It got good reviews across the board, as intelligent sci-fiction, packed with smart ideas. Spain has to wait until December.